Full Hot Air: Many of the engines were fitted with a loop of tubing that pulled clean air from inside the air cleaner/carb air horn, looped it through a passage in the exhaust manifold, and then passed it over the bimetal spring in the choke housing. This system worked very well in most, if not all, circumstances. However, the tubes were prone to rust and most have long ago rotted off. Here's a thread on FTE where a repair kit is used to replace the tubing: Hooking Up My Choke. 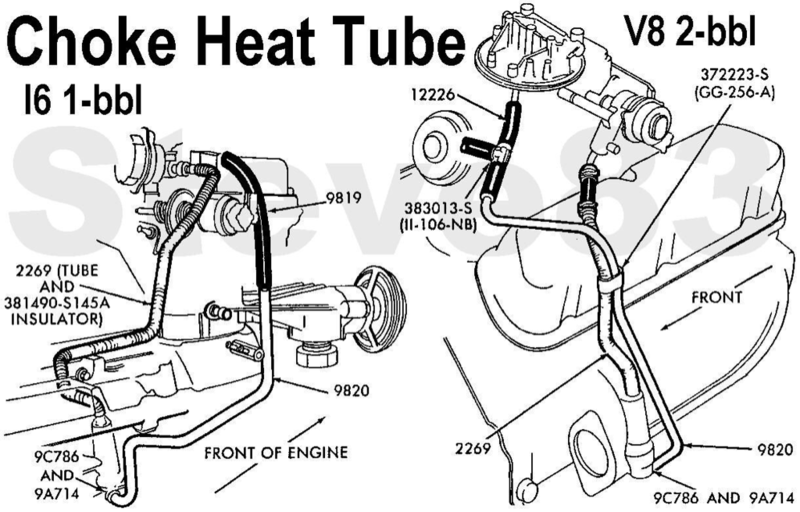 Hot Air w/Electric Assist: The 1981 factory shop manual says this: "The hot air choke with the electric assist choke cap functions as follows: as the engine warms up, manifold heat transmitted by hot air to the choke housing relaxes the bimetal permitting the choke to open. The electric assist has a ceramic heating pill. At temperatures above 12 degrees C (54 degrees F) to 23 degrees C (74 degrees F), the temperature sensing switch closes and current is supplied to the heater causing the bimetal to pull the choke plate open at an increased rate. The electric assist choke cap is powered from the stator tap of the alternator." Full Electric: The Holley 4180C used a full electric choke w/o the hot air from the exhaust manifold. The 1981 factory shop manual says "The 12-volt choke system is controlled by an engine "RUN" signal from a three terminal oil pressure switch having two sets of contacts. The two outside terminals are for the ungrounded normally open contacts which actuate the electric choke. The normally open contacts complete the circuit to ground when closed permitting the choke heater to operate when the ignition switch is in "RUN". The center terminal is for the case grounded normally closed contacts with actuate the oil pressure or engine light. Vehicles without full electric choke use a one terminal oil pressure switches or senders. ​I should point out that if you install an aftermarket 4bbl carb, like a Holley, Edelbrock, or Demon in place of a Motorcraft 2bbl and use the factory electric choke wire you are going to have problems. That's because the factory wire for a 2bbl, if any since not all 2bbl's had them, will supply about 7 volts and the aftermarket carbs require 12 volts.